The inauguration served not only to formally launch the satellite link, but also to provide its first effective demonstration–as the inauguration was held simultaneously at the four Amrita University campuses, with all present at each centre interacting freely via the link. The initiative was made possible through a unique “university-government-industry” partnership: an alliance between Amrita University, ISRO (India Space Research Organisation), Cognizant Technology Solutions and Cadence Design Systems. 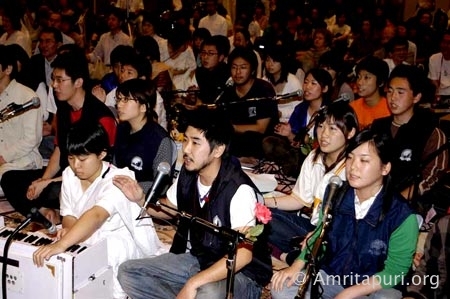 The first message broadcast to the four campuses was none other than that of Amma, who congratulated and encouraged those who’d made possible the technological connection, while at the same time counselling everyone to not forget the importance of spiritual connection–the inner communion with the Atman and the communion of fellow hearts. After Amma’s speech, the link was officially inaugurated in each of the campus centres: in Amritapuri by Padma Bhushan Dr. G. Madhavan Nair (Chairman of ISRO), in Cochin by Dr. S. Banerjee (Director of BARC), in Bangalore by Sri. Balu Doraisamy (President of Hewlett-Packard India) and in Coimbatore by Professor V.S. Ramamurthy (Secretary, Department of Science & Technology, Government of India). Immediate uses for the satellite link will be in allowing Amrita University students to not only “attend” but also to interact in lectures taking place on the all four campuses. As Amrita University is home to computer, medical, management and engineering institutions, the link will also be used to build inter-disciplinary research laboratories–for example, in such areas as bio-engineering and nano-technology. But these are only the beginning. As Dr. Venkat Rangan, the Vice-Chancellor of Amrita Vishwa Vidyapeetham, explained in his speech, the next step lies in using the link to extend Amrita University-calibre education to India’s remote masses. In his speech, ISRO’s Dr. G. Madhavan Nair explained how such satellite links hold the potential to transform India in terms of education and healthcare, both of which areas are being championed by Amma’s institutions. He said how inspired he’d been just days before at seeing doctors at Amma’s AIMS hospital evaluating patients in remote areas of Leh-Ladakh and the Lakshadweep Islands via an ISRO satellite. And now, he said, Amma’s institutions were making bold steps on the educational front as well. In Coimbatore, Professor V.S. Ramamurthy spoke along the same lines, reiterating how the power of the link lies in taking the universities to the students and in taking the hospitals to the patients. One of the Amritapuri campus’ guests of honour was Dr. Bharat Jayaraman, a professor from the State University of New York in Buffalo who has been involved with “distance teaching” for the past 20 years. Dr. Jayarman said he could not believe that a Deemed University not much more than a year old could have set up such a complex and advance satellite-link system. Among the hundreds of volunteers who come to help during Amma’s program in Chennai there is a ‘special’ group. They are the residents of Amma’s Amritakuteeram housing project in Avadi, located on the outskirts of the city. You cannot tell them apart from any of the other volunteers because at first glance they look just like anybody else. It is not until you hear their stories that you realise there is more poverty and suffering under the surface of a colourful sari and a clean dhoti than you might expect. Amma has said that even many of her Kerala devotees need to save for a whole year just to travel to Amritapuri for Amma’s darshan. Many of them even borrow a sari to make sure they look proper. Cheap rents in Chennai run around Rs. 500 per month, a sum that is too high for the city’s poorest of the poor. 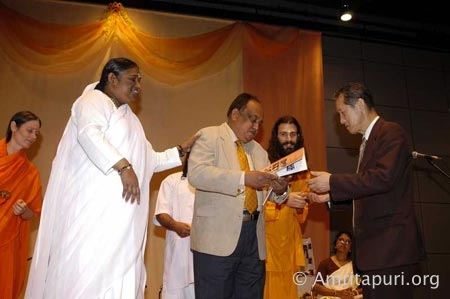 But through Amritakuteeram progect, many such people are getting a second chance in the form of a free home in a clean and well-maintained community. 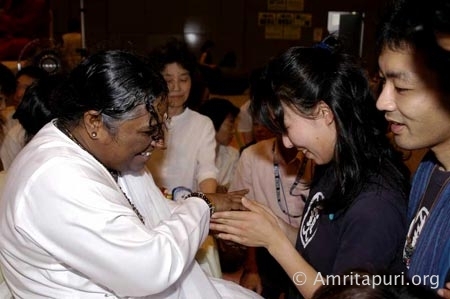 When speaking with the Avadi Amritakuteeram residents who were volunteering during Amma’s Brahmasthanam Festival, we heard stories of renewal and gratitude. Peneer Selvam, a man with a bright smile, lives in Amritakuteeram Avadi house #4. 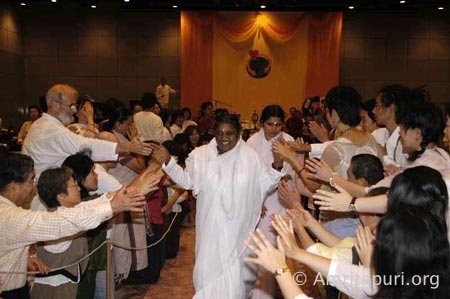 During Amma’s 2004 Chennai visit, he was busy running from one seva job to another. He has been suffering from leprosy for the past six years, which has caused the loss of half of the fingers on each of his hands, but at least now that he doesn’t have to pay rent he can afford treatment. Leprosy damages the nerves and, when not treated, deteriorates the flesh. Each year when Amma comes to Chennai, he is eager to help, mostly painting. 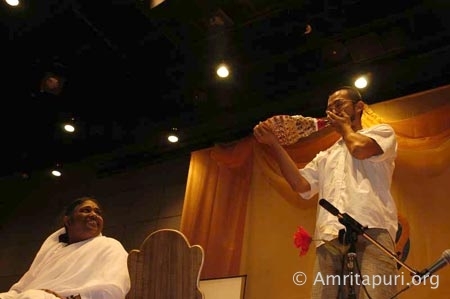 In 2004, Amma asked him to paint the back of the darshan stage and the walls. Selvam’s neighbour, in house #5, is Ketera Balal (39), who lives with his 70-year-old father. Together, they manage a little STD/ISD [telephone] booth in a Chennai government hospital. Thanks to the free house given by the ashram, he was able to save enough money to pay for the STD booth’s business license. “I’m very happy and grateful to Amma,” he says. “We live first class!” says 16-year-old Savitri Murugan, the youngest of the group of the Amritakuteeram volunteers. Working in different corners of the city had caused Savitri’s family to split apart, but Amma’s gift of an Amritakuteeram house has allowed them to live together again. Her mother is now supporting the family by teaching at a school for deaf children. Lakshmi Manimaran (32) lives with her husband and two children in house #54. They used to rent a small room on the outskirts of Chennai with money earned by selling lottery tickets. But when the lottery closed, they were no longer able to afford the room. It was then that they applied and were approval for an Amritakuteeram home. Her family now makes its living selling incense sticks door to door. On a good day, they make a profit of around Rs. 40. With the money they save by not having to pay rent, Lakshmi and her husband are able to pay for the education of their children. Their 12-year-old daughter goes to a government school, but still, a school-uniform and a school fee of Rs. 150 per year are required. They are sending their four-year-old son to a private school, which costs Rs. 150 a month. They never could have afforded it without the free home from the ashram. Lakshmi says her hopes for the family’s future are riding on the education of her son. Affording rent was also a problem for Likalavari (42) of house #33. She works six days a week in a factory that exports clothing, checking to make sure the buttons are sewn on properly. She makes about Rs. 1,100 a month this way, with which she is able to send her 17-year-old to school. He is in 11 th standard now and hopes to study commerce. “My life is so much better now,” she says with a smile. Devi (27) and Venkatesh (37) live with their family in #18. They have two daughters, ages seven and five. “Problems? No, we don’t have problems,” says Venkatesh, with a smile. He was born with one crippled leg, but his eyes have a soft and gentle look. His wife just came back from serving Amma by handing her prasad to distribute to those coming for darshan. She is still blushing from the excitement. She is wearing the seva badge she wore while grinding coconut for the chutney all afternoon. “We made chutney to feed thousands! ” she says excitedly. Venkatesh is a tailor and is able to work out of their new Amritakuteeram home. 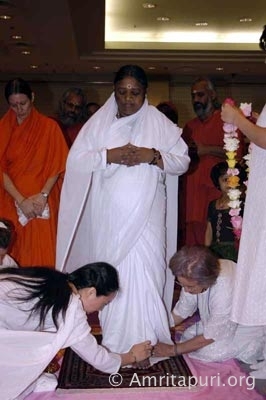 This year for Amma’s Chennai programme he was asked to stitch the lace hanging off the edge of the stage. Before Amrita Institute of Technology and Science was under the auspices of Amrita Vishwa Vidyapeetham, it was affiliated with Anna University in Madras. As such, the two batches enrolled at AITEC are still associated with Anna University, and their exam scores are measured against the exam scores of the other 227 colleges which are also affiliated with Anna University. In the results posted for the May 2004 examinations in the Bachelor’s of Engineering and Bachelor’s of Technology programs, students at AITEC finished first out of all 227 colleges associated with Anna University. Out of 1005 AITEC students who appeared for the exam, 809 passed, giving AITEC a pass rate of 76.7%, compared to an average pass rate of 41.39% for all Anna University colleges. 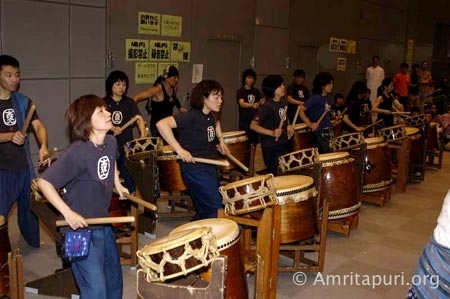 AITEC’s stellar performance is representative of the level of academic excellence throughout Amrita University. This goes to show that the deemed university status recently conferred on Amrita Institutions by the UGC is well deserved. This young university is marching forward with a misson: to be in the forefront of the universities of India, both in academic excellence and cultural values. Congratulations to the students of AITEC. 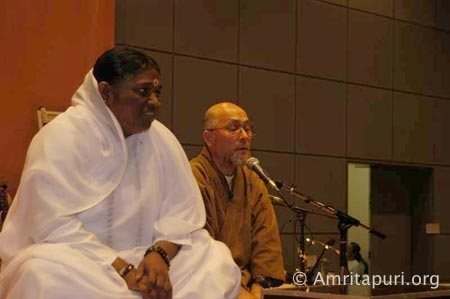 One of the most beautiful bhajans during Amma’s Trissur programme was silent. It was performed for Amma by students of Her “Amrita Speech and Hearing Improvement School” (ASHIS). Grace us with Your compassion,Lord, I have no one but you! 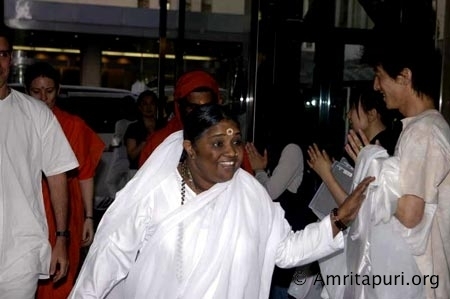 As the students performed the song on the stage–behind Amma and a little bit to Her right–Amma kept pausing Her darshan so She could turn and watch them. 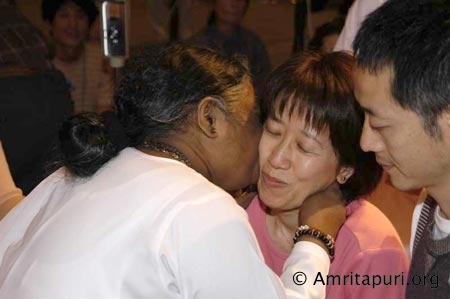 “Love has no specific language,” Amma frequently says when asked how She is able to connect with so many around the world who do not speak Malayalam. Never had the statement seemed more true. 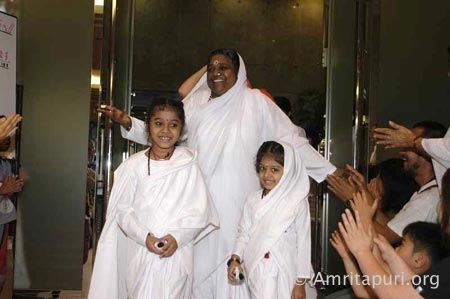 In the end, Amma gave the children a sign of Her own—applause followed by a big thumbs up. The famous Pooram grounds against the backdrop of the age old Shiva temple was where Amma’s Trissur programme was held this year. It is world famous for its elephant pageant, as part of the annual temple festival where deities of neighbouring temples, Lord Krishna and Devi are brought face to face with each other in presence of a parade of more than 15 elephants on either side. 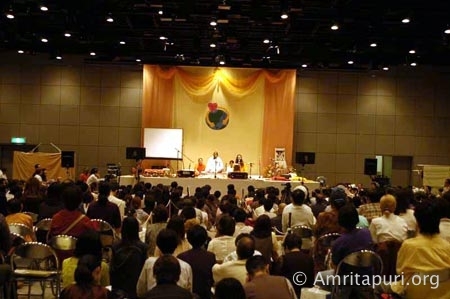 This year’s festival had taken place just three day’s prior to Amma’s programme. The Pooram was a fitting harbinger of Amma’s coming, as in Amma we find the merger of these two aspects of the Divine—the ultimate detachment of the Lord Krishna and the ultimate attachment of Devi, the Mother. True to its legacy, temple elephants welcomed Amma to Trissur. The majestic elephants with men on top holding aloft muthukudas, the brightly coloured, silver- and gold-fringed parasols receiving Amma were a feast for the eyes. One would have seen Amma being received with the same traditional muthukudas or decorated umbrellas across Indian cities. In Indian culture, the muthukudas symbolizes the standing and stature of the event or the person in the society. Incidentally, Trissur is home for these beautiful umbrellas with all their richness and embroidery. Umbrellas with more than fifty colour patterns of the most exotic type were lined up on either side of the aisle leading up to the stage. The Shiva temple grounds are open and has no shelter available to shield people from the rains. 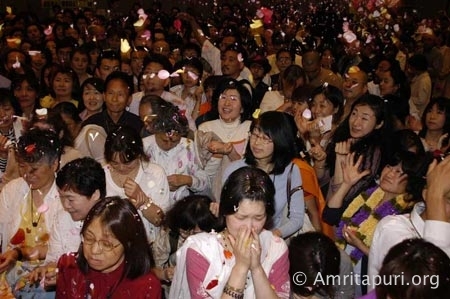 So, when the surprise pre-monsoon rains started pouring after Amma’s satsang and as the bhajans started, more than 30,000 devotees who had gathered they had nowhere to go to keep themselves from getting wet. Monsoon hits Kerala invariably on first of June every year. 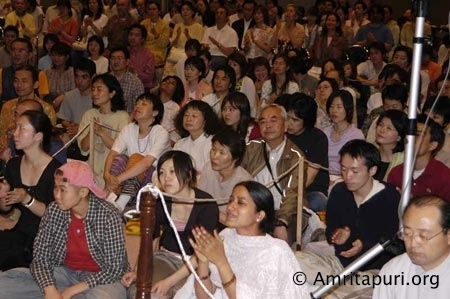 Fortunately, most of them had brought umbrellas, and those who didn’t, quickly improvised, lifting their plastic chairs over their heads so that they could continue to watch and listen to Amma. 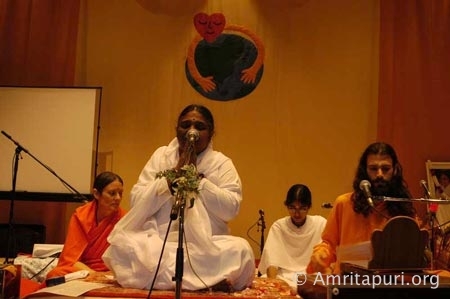 So it turned out that the Trissur programme was the unfolding of yet another facet of Amma’s leela, this time more tangible and visible than ever before. Because of their faith in Amma, so many who trusted Amma’s words and cared to carry their umbrellas were spared a soggy night. It held a very important spiritual lesson for all those who assembled. We are not spared of trying situations in the journey of life, but when they visit us we oftentimes find that we already have the umbrella of faith to shield us from adversities. It rained all night, and almost no one seemed to care. Even those who had drenched did not resent it and were all smiles. 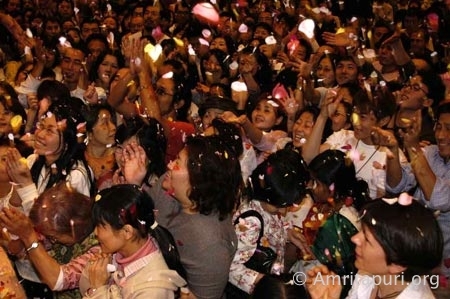 As it poured through the night and as darshan progressed, at around 4:00 a.m., Amma beckoned all those without umbrella (more than 500) to come on to the stage and dry themselves. There, She had Her disciples to help them to dry themselves. Most of them had tokens for darshan with late numbers were and would have had to wait till noon for Amma’s blessing. 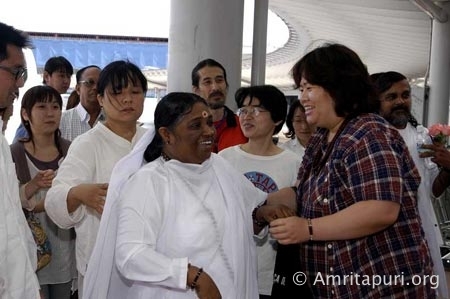 Amma’s compassion knew no bounds and She asked them to join the queue so that they would have early darshan. 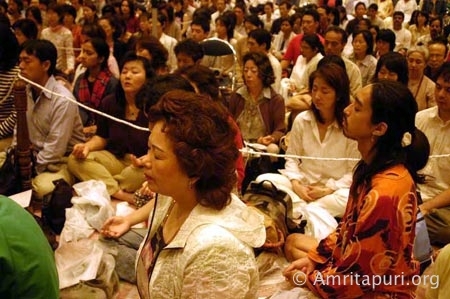 Faith, surrender, adaptability and Guru’s all flowing compassion – in Trissur, all this was there in good measure.